While many people are happily opening presents, spending time with loved ones or tucking into a turkey dinner on Christmas Day, approximately one million people will be working across the UK. Of those, a quarter will be nurses or carers. 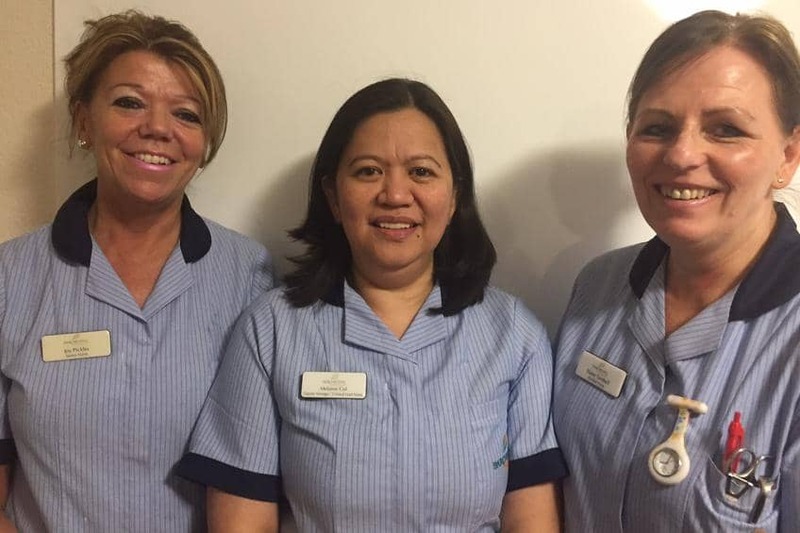 Three nurses who will be working across Christmas and New Year this year are Joy Pickles, Melanie Col and Elaine Turnbull, all of whom work at The Dales, one of Barchester’s homes in North Yorkshire. With nearly 70 years of shared experience of working at The Dales between them; they have seen a lot of festive spirit. Melanie began her career as a Senior Care Assistant at The Dales in 2004. Following the training she received with Barchester she became a nurse and is now Deputy Manager at the home. Melanie has turned working Christmas Day into a family affair. “A lot of my family are in the Philippines,” she says. “But my daughter is in the UK, so if I work on Christmas Day my daughter comes into the home to see me and the residents. Over the festive period we have a lot of entertainment, such as local school choirs coming in to sing Christmas carols, which the residents love as they enjoy seeing the young people. My daughter likes to come in to see everyone having fun. This year might be a little different though, as I now have an eight-month-old too; I’m sure the residents would love to see the baby! “A few days before Christmas, the hairdresser pays a visit so everyone can look their best. On Christmas Eve we lay out a special outfit for each resident; even some of our more frail residents get dressed up. On Christmas Day everyone makes a little extra effort. The staff dress up in their smart clothes too, so we all join in, we’re one big happy family. Joy adds, “It really is lovely here over the Festive period, but at the end of the day we are still working. As with many places offering any type of care we have had a resident die on Christmas Day, which feels particularly sad. It seems the worst time to break the news to a family. All the same processes have to be adhered to in addition to trying to keep cheerful for everyone else. Elaine, an enrolled nurse, will be working New Year’s Eve this year. She explains, “We all dress up for New Year and have a special menu. Not many of the residents stay up to see the New Year in any more, but we used to have a few residents who would love to watch the fireworks on TV. I have spent many a Christmas and New Year here, some dressed a little bit differently, I have even been an elf!